Unchanged for decacdes - and this I rather like. Things are quite simple here. 1 real ale on - labelled Harbour Ale but I am sure its Wye Valley Butty Bach. Superb condition. 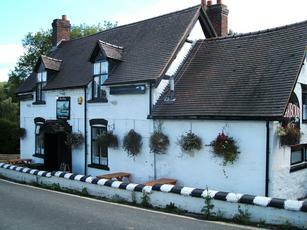 Nice in the summer and great for ramblers and users of the Severn Valley. Called in after a walk down the river from Highley. I was hungry and thirsty and very glad to see a pub that was open. How it remains open with the miserable sod behind the bar beggars belief. The report below this matches our experience completely. Hobson's Best was in good form; the sandwich was passable. So much could be really good about this place. Has seen better days. Is there any excuse for chairs with badly torn upholstery, faded bunting (probably from the 1977 jubilee) and banners advertising September 2011's beer festival? Only Hobson's Best available (which was in good order admittedly) served by a sullen barmaid who spoke as few words as necessary to get the job done (even a "Yes please?" would be a bit of welcome). The cider is Stowford Press. If you get off the Severn Valley Railway and don't want to visit the tearoom in Arley then this is an alternative and it has a good beer garden for summer days but I wouldn't make a detour otherwise. Map marker is incorrect Pub is over the bridge toward the river, Marker shows a different building altogether.